Tallinn is a medieval gem on the coast of the Baltic Sea. The heart of the city, the Old Town, has been under UNESCO World Heritage protection since 1997. There is much to be discovered in Tallinn both for first-time visitors and locals alike. The year 2019 marks 800 years since Danes conquered what would one day be Tallinn and established the foundation of the medieval city where it stands today. 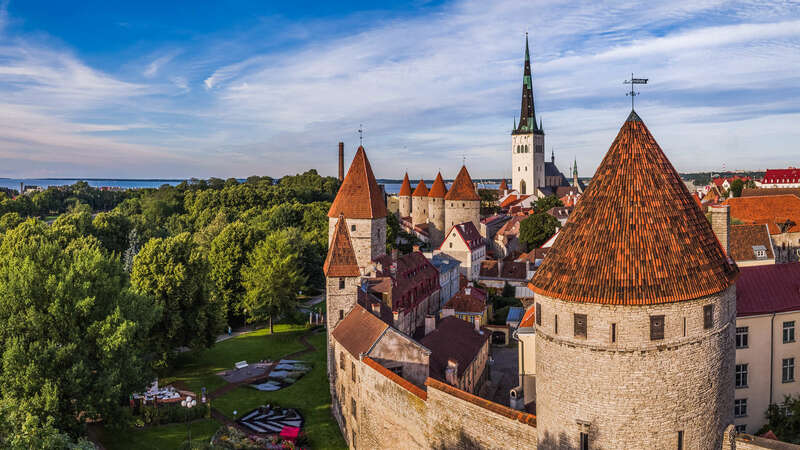 In light of this, we’ve made a checklist of the historic, the old, and above all else – the medieval – things to see, do and experience in Tallinn. See if you can check them all off, or maybe you’ve done so already! Even the locals who have lived their whole lives in Tallinn fall for this. We seem to have very fixed routes through the Old Town, a way to get from A to B, but when we deviate, even a little, we are hopelessly lost on the cobbled, uneven, and bendy Old Town streets. This is actually highly recommended. A walk through the Old Town should absolutely cover the beautiful, popular spots like the Danish King’s Garden, Kohtuosta viewing platform, or the unavoidable Town Hall Square and St. Catherine’s Passage. But also make sure to follow the curving and confusing Müürivahe Street, full of nostalgic cafés. Or Laboratooriumi Street, shadowed on one side by the medieval city wall towers, some of which you can poke your nose in during the day, and on the other side by small, old houses where you can find hiding a little church or an unmarked cocktail bar. To feel like a time traveller, walk down Aida and Vaimu Streets, which seem to not have changed at all over the centuries. Don’t be afraid to peek through shadowed archways like Saiakangi, Börsi käik, or the Masters’ Courtyard. The Old Town’s streets are far from straight and seem to curve and bend in every which way, but they do so in the general direction of the Town Hall Square, the old marketplace. So, by this logic, eventually you should make it back there. Another option if you get tired of wandering is to ask a local for help. This might prove harder than you think though. It is not that we don’t want to help, but for Estonians it is rude to bother a stranger or to offer help randomly even if you are looking obviously lost. Be brave, approach a fast-walking, earphone-wearing local and just ask. We will look surprised in the beginning but are actually happy to assist. Don’t be scared! And if the first person ran away from you then hunt down another one. You can spend hours just exploring the Old Town. It’s not very big, but there is much to be discovered. The best time to do so is in summer when the evenings stretch long and the sun doesn’t seem to want to set. Avoid, if you can, the busy midday bustle and spend your time wandering later when the shadows stretch the streets longer. And don’t worry, the locals are night creatures in summer; we don’t come out until it’s 11 or 12 in the evening. Then, we flock to the bars and trendy cocktail venues. Here lies another opportunity to corner a local for a conversation. But again, the same problem: we don’t talk to strangers. Approach with caution and bring a bribe, like food, a drink, or a compliment about Estonia. Works like a charm. Wandering feet and curious eyes can only tell you so much. There is a lot to be learned about the history of Tallinn and Estonians as people from different tours you can take in the city. Tallinn, like many European cities, offers a wide variety of tours for every taste, from private guides to free walking tours. Try the Tales of Reval tour, a free daily walking tour that anyone can join. The guide dresses and talks as if they have stepped out of the medieval period and concentrate their stories on the life and times of old Tallinn, once called Reval, a proud and prosperous Hanseatic League trade town. If you want to hear about the ghostly and ghoulish, take the Ghosts and Legends tour. Follow the guide down the streets, some of which you might think you know, and hear about the dark side of the city, both the historic and the imaginary. For a more interactive experience, try the Tallinn Legends theatrical museum behind the Town Hall. Here, the ghosts visually appear in front of you and legends are acted out. To each their own. Of all the stories of Tallinn, you should not miss out on a local bestseller, especially if the medieval and mysterious are your thing. Indrek Hargla, a popular Estonian author, has penned a series of books about the pharmacist Melchior who is faced with suspicious murder mysteries in 15th century Tallinn. Like a medieval Hercule Poirot or Sherlock Holmes, he tries to unriddle the truth using methods available to him in the Middle Ages. The books are not only enjoyable for the who-done-it part but also for the gripping description of medieval life in Tallinn. This book series has been translated into several foreign languages and can be easily found in any Estonian bookstore, not to mention on numerous bookshelves in Estonian homes. Discovering new places can make one hungry. Tallinn is steadily becoming a foodie destination with more restaurants, gastro pubs, and cafés than sometimes seem possible. Ranging from high-end Nordic cuisine to cheap, local favourites, the Old Town has it all. Indeed, it even has the historic. The thing with the following restaurants is that you will probably not see many locals in them, especially in the summer. This is not because we don’t like them or haven’t tried them. We do and we have. It’s just that eating out in the Old Town is usually reserved for special occasions like anniversaries, birthdays, hot dates, or the company’s Christmas party. Here, for once, there is no potato in sight and various local wildlife from wild boar to bear is featured. The unusual flavours are novel but really good, and the unique experience makes for a treasured memory. You can start by testing the waters, or more accurately the tastes, in the Town Hall which houses a little place called III Draakon. In the tradition of cheap eateries, the prices for food are incredibly low for the Old Town, (1 to 3,5€), and for this money you can try elk meat soup, different pies, sausages, and pickles (for free if you know where they are). This is the kind of a place where you get a little feel for medieval life. No one cleans your dishes up except for you, and if you fail, the landlady might have something to say to you. There are no spoons for the soup because your money doesn’t cover such luxuries, so bring your own or chug and hope for the best like the rest of us. If you don’t find enough room to sit, then feel free to invade someone else’s table if there is space. Similar to III Draakon, but way more elaborate and fancy, is Olde Hansa around the corner. Set up in a historic warehouse building, you can try medieval cooking where cinnamon flavours the meat and honey sweetens the beer. The staff talks a little funny and calls your credit card ‘black magic’, but it is magic that they are happy to accept. Across the road is Peppersack, a place of good, sturdy Estonian-style food and nightly sword fights. Here too, people adorn costumes with feathered hats and pointy shoes to keep up appearances. If committing to a whole meal seems too much, find the historic Town Hall Pharmacy – Raeapteek – which has been selling medicine since 1422, making it the oldest working pharmacy in Europe. Concepts of what is medicinal, though, have changed over time. For instance, a little bite of marzipan can go a long way in helping your mood improve and a shot of claret, red wine mixed with more spices you can name, will cure nearly everything. These things are still available along with clinically tested painkillers. This is an absolute must. Tallinn is called the City of Towers, and for a good reason. There are a lot of towers in this city. Church towers, the Town Hall tower, city wall towers, Toompea Castle’s towers: there are a lot of options available if you are not afraid of heights. If you would rather not climb up narrow stairs to centuries-old places, then you can admire them from afar as well. Most of the towers in the Old Town are open to visitors in summer, but some take a little more effort to visit than others like Tall Hermann tower of Toompea Castle, which is only open to the public on special occasions such as the birthday of the Estonian flag on June 4th. St Olav’s church tower, on the other hand, is very popular and open for a small fee every day in summer. It is just really hard to go up the 200 plus narrow, spiralling steps with two-way traffic. Hard, yes, but worth it as the view is amazing. The city wall also has 24 surviving towers out of the 46 which originally lined the town. Some of these are private property, but most are open to public. Perhaps the coolest is Kiek in de Kök tower, the most badass cannon tower of the city wall with an interesting museum about different fortifications of Tallinn and access to underground bastion tunnels. You can also visit several towers at once and walk the wall in between them. One such place is in the Danish King’s Garden where you can gain access from the Maiden’s Tower. Another place is the Nunn’s Tower, which gives you access to three towers and the wall between them. All the towers provide a different angle and a beautiful view of the Old Town, but it is impossible to fit the whole skyline into your photo from any one of them. A local pro tip therefore is to walk down the seaside promenade towards Pirita and capture the view over the bay, or better still, if you should happen to find yourself on a ship, admire the unobstructed view of the Old Town from the water. Tallinn’s skyline is so iconic that for over a century, it has been prominently featured on one product’s packaging – the humble tinned sprat. Hence why we call Tallinn’s skyline the ‘tin can view’. Practically Estonia’s national food, Baltic Sea sprat can be found in many cafés on top of rye bread open sandwiches. It’s worth a shot, especially because deep down, most Estonians love this food. We just don’t advertise it. Tallinn is downright riddled with museums. Big and small, state-run or private projects, there are many covering a variety of subjects. Also, although most old churches are not officially museums, they operate a little similarly, meaning they have a compulsory donation for entry. Don’t miss out on St. Mary’s Cathedral in the upper town, the burial place of local nobility until the 18th century and still decorated by the families’ coats of arms, or the Church of the Holy Spirit in the lower town, which looks the most medieval of all the Old Town’s churches because it has been rebuilt the least. To find out how the people of Tallinn lived when the trade of the Hanseatic League was going well on the Baltic Sea, you should visit what is considered the oldest surviving house in the Old Town and coincidentally also the City Museum. You can find this place on Vene Street where it stands out by leaning a little out into the street; the 14th-century building is so old, it doesn’t line up with other buildings anymore. If only these walls could talk! But they almost do, because the museum is impressively informative about the development of Tallinn through the ages. Almost directly across the street is St. Catherine’s Passage, a little side street with many cute, little handicraft shops selling things like hats or leather goods, almost an exhibit in and of itself. On one side of the street is the old St. Catherine’s Church wall with a display of tombstones recovered from the destroyed church. Behind the wall, a little of the old church and the accompanying Dominican Monastery can still be found. Enter from a little archway from Müürivahe Street and you can find the oldest library in Tallinn – the Librarium Mauritanum, a single room of books from 1246 and beyond. Another destroyed sacred space is the St. Bridget's Convent, now within city limits, but originally located way out of town. It was burnt down by Ivan the Terrible. The ruins are still surrounded by a historic graveyard and the sight is also a popular concert venue in summer. Speaking of music, if you can catch their concert, there is nothing more historically authentic than Hortus Musicus, a band that plays historic music and has done so since 1972. They often give concerts from the Short Leg Gate Tower that just so happens to be one of the most haunted towers in Tallinn. Another amazing place for music is St. Nicholas’ Museum, which often hosts concerts in the evenings. This medieval church is one of the oldest in Tallinn, but sadly it was very badly damaged during the Second World War. During the Soviet period, the reconstruction took nearly thirty years after which the church became a medieval art museum. Some of the most unique and precious art in the whole region hides inside – like the only Dance Macabre surviving on canvas by Bernt Notke from 1495, or the silver collection, or the outstanding Herman Rode altar. The Town Hall is also open to visitors in summer and the rest of the year for special events, such as, you guessed it, concerts; Estonians love music, and we are called the Singing Nation. Old or new, we love a good tune. Last but not least is the History Museum in the Great Guild House. A stone’s throw from the Town Hall Square, the museum covers a very long period of time, but people are often most amused by the cabinet of curiosities and impressed by the historic weapons collection. The 15th-century building itself is also amazingly well preserved. There are more cool museums, places to eat, and towers to climb than you can possibly cover in your first visit. This just means you have to come back! Next time, we will probably have a few new things set up as well. Tallinn is ever-changing, always building, and above all, never finished.